In a zero crossing SSR if the output is a triac, would the gate be fired/triggered every 180° or would the gate be applied a constant voltage all the time? I'm asking because in both cases the load will pass the whole aleternating current. EDIT: First of all, the question is not about the phase control; it is about ON OFF control either with a random or with zero crossing relay. As you see as long as the control input of the SSR Vcon is ON the AC is always ON. I also added the time points A, B, X and Y. But when the Vcon is turned ON at time A, the zero crossing circuit waits a bit more for Vac(or Iac?) to approach almost to zero and at point X the gate triggers to turn ON the AC power. Similar relation is valid for point B and Y. And all these are for to minimize L*di/dt. So this type of ON OFF zero crossing control can be used for inductive loads(?). But phase control cannot be used for inductive loads because there is no zero crossing mechanism there? 1-) In my hand drawn figure, how would the gate voltage look like? I hope my questions are more clear now. At turn ON zero crossing prevents high current for capacitive loads. The first plot is mimicking zero crossing control signal and showing line voltage. The middle plot is the voltage across a pure resistive load 220 Ohm. The third plot is the voltage across R L the inductive load. The gate current comes from the load, and will be triggered near the zero crossing if it is to be on, so every 180°. There is no guarantee that there will be no DC component in the load current, if that is what you are asking, but it usually works out that way. If you were to pathologically provide pulses to the SSR timed to be near alternating zero crossings you could make it into a rectifier (for some, probably most, SSR designs). You should think of gate current, not gate voltage. In the example, the gate current will generally consist of spikes perhaps 100-200 microseconds long around the zero crossing. Zero cross switching is mostly for EMI reduction. If the device is switching infrequently, the EMI is less bothersome, as with mechanical relays. Of course the thyristor will not switch off until the current drops below the holding current (usually considered close to zero compared to the load current). Apart from the benefits of reduced electro-magnetic interference (EMI) as a result of zero-cross switching there is the added benefit of simplicity of the control circuit. This can be switched on at any time without reference to the mains cycle so no zero-cross monitoring is required. ... would the gate be fired/triggered every 180° or would the gate be applied a constant voltage all the time? Generally it would be on all the time during the "on time" as shown in Figure 1. Note the waveform shows complete half-cycles. Using AC current to trigger Triac explains the internal working of a zero-cross SSR. Confusion with TRIAC firing and zero crossing point. Update after question was edited. That is the same as my Figure 1. It waits for voltage to get close to zero as explained in my answer to Using AC current to trigger Triac. It can't be waiting for IAC to drop to zero as it is already zero because the triac is off. 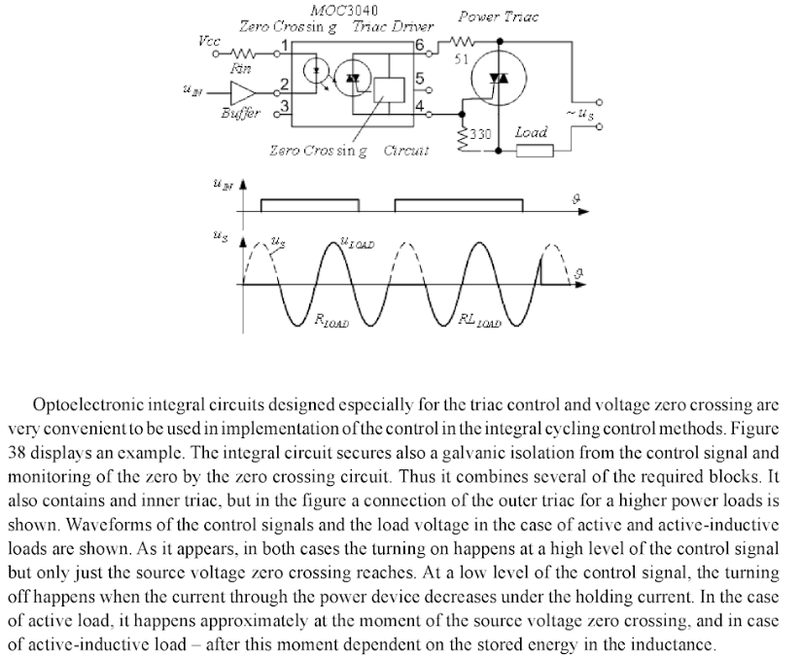 So this type of ON OFF zero crossing control can be used for inductive loads(?). But phase control cannot be used for inductive loads because there is no zero crossing mechanism there? There is. When the SSR is off it knows nothing about the load so it will turn on as normal. When the control signal is removed the output triac will turn off when the load current falls below the hold-on value of the triac. 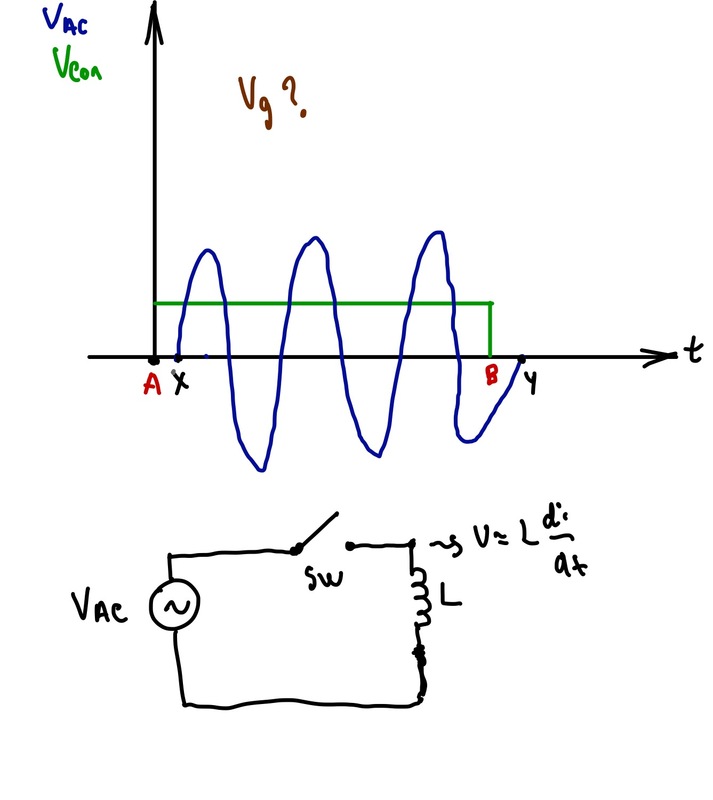 In my hand drawn figure, how would the gate voltage look like? Gate usually refers to the gate of the triac and this is not accessible to us in a sealed SSR. We can only apply the DC control voltage and this is typically 3 to 30 V DC. If the interference generated is not a problem then no. Otherwise use zero-crossing SSR. I'm not asking about power control. The SSR in question is used as a switch to turn on a load for very very long time and turn off when it is not used, not a heat control. There is no difference other than the duration of the on and off times. I am not sure if I understand your question correctly but it appear to me that there is a clarification to bring before an attempt of answer. SSR is not the same as Triac. A Triac is a semiconductor device that require a minimum bias (between Gate and MT1) in order to be put into conductive state and it will stay conductive until there is no more voltage applied between its MT1 and MT2 (MT2 being the other terminal). The Triac will work in 4 possible triggering quadrants. If you polarize the Gate with a positive current while MT2 is positive, then the Triac will fire (go into conductive mode). That is Quadrant+1. You could also use the Triac in Quadrant -1 (Gate negative and MT2 positive). Also in Quadrant +3(where Gate is positive and MT2 is negative). Quadrant -3 is also possible( Gate is negative and MT2 negative). A Triac, once in a conductive state, will conduct until the current MT1:MT2 goes below a small value called holding current. This works both from Mt2 positive.vs.MT1 and with MT2 negative.vs.MT1. If you drive a resistive load with an AC power source, switched by a Triac, it will cease conductivity when the AC signal goes from a low voltage + to - or - to +. In other words, a Triac will only conduct from trigger to the next zero crossing. In order to have the Triac to conduct in the following 180 to 360 degrees it is necessary to keep the Gate signal active. In your "First Plot" it is clearly shown that you are triggering a Triac at the Gate with a positive signal for the 0-180 phase, and Gate negative for the following 180-360 phase, hence, constant conductive state during the whole AC cycle, until the Gate trigger is terminated or the next zero crossing arrive. Keep in mind that a Triac is not a zero crossing device in itself. A Triac will go conductive even if you trigger the Gate at say 70 degrees angle. It will start conduction at 70 degrees until the half cycle terminate and will go "open" until another Gate trigger is applied. An SSR with zero crossing feature is another device. An SSR could be made with a power switching device such as an internal Triac or could also be built with a special arrangement of Dual P N MOSFET in series. In case of the Triac version the device would exhibit similar behavior as the Triac but with a little twist, that is, it would only switch ON when the voltage between MT1 and MT2 would be near zero ( + or - ). In the case of the SSR MOSFET version these are usually not made with zero crossing feature. Instead they are bidirectional power switch that could be turned ON and OFF regardless of the phase angle. This is probably not the device you are referring to. Now, let's examine the "third plot". For sake of explanation it is adequate to remember that an inductor will oppose change of current by Inducing a voltage, contrarily to a capacitor that will oppose a change of voltage by drawing more current. During the first 0-180 degrees angle, in third plot, the voltage is raising from 0 to 160V peak then back to 0, slowly building a magnetic field into the armature of the inductor. At 90 degrees the voltage start to go lower dV/dT < 0. From 0 to 180 the current on CR2:MT2 is going from 0 to max, the voltage on L2 R2 is also positive ( from right to left). As soon as the angle goes from 90 degrees we get into the dV/dT from + to - the magnetic induction built from 0 to 180 degrees will start to generate a positive current on MT2, acting like a current generator, even though the AC source is starting to go lower, the inductor opposes a change of current and keep generating a current into the "closed switch" Triac. This will keep going until there is no more magnetic energy reserve in the inductor core. During the first 0 to 180 degrees the voltage on the inductor was always positive, going from 0 to 160 to almost 0. 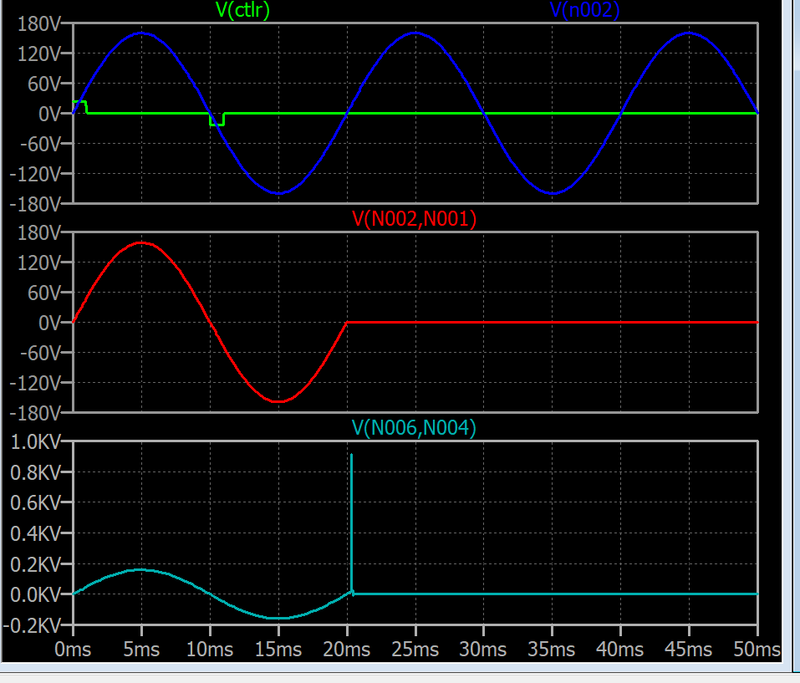 During this whole period the current in the inductor is raising to a peak of about 1A. (based on 160Vpeak during 8mSec on an inductor of 100mH in series with a resistor of 120 ohms) (I am avoiding complicated math here for same of shorting this already too long explanation) 8.3mSec later (180 degrees) the source is back to zero volt and going negative. The Triac is still receiving a big current of about 1 amps. The Triac is staying into conduction status because the voltage across MT2:MT1 is still positive, because the inductor is acting as a generator. Now, at 8.3mSec the AC source is going negative, still generating current in the loop but this current is now diminishing cause by a loss of magnetization. Because the generated voltage is lowering due to collapsing magnetization in the inductor core and the AC source in going into a less negative voltage ( we are now passed 270 degrees ) there is approaching a point in time were the AC source voltage will be equal to the residual collapsing voltage induced. At equilibrium, Vsource will equal -Vinductor, hence, CR2:MT2 will be at zero volt. The Triac will become "OPEN". At this point there is still residual magnetization in the inductor, still inducing a voltage on L2. Suppose this voltage is 20Vpeak. But now the Gate is no longer triggering the Triac. The residual inductor core magnetization will still generate a current that can no longer circulate through the now opened circuit. The energy still in the inductor core must dissipate somewhere, hence, generate a huge spike on the "Opened" Triac. It is at this point that the Triac will go over the VDRM into a forbidden operation (repetitive peak off-state voltage). At this point the Triac may be destroyed. To avoid that situation you need to put in parallel with the inductor a capacitor of high enough value sufficient to absorb the residual magnetically stores energy in that inductor. Notice that using a capacitor in parallel with the inductor in series with a Switch such as a Triac is OK only so long as the AC source is sinusoidal and that the SSR is featuring a Zero Crossing operation. Triggering the AC source at 90 degrees into a capacitor would be just as catastrophic but now you would probably burn the Triac because of too much peak current instead of to high peak spike voltage. 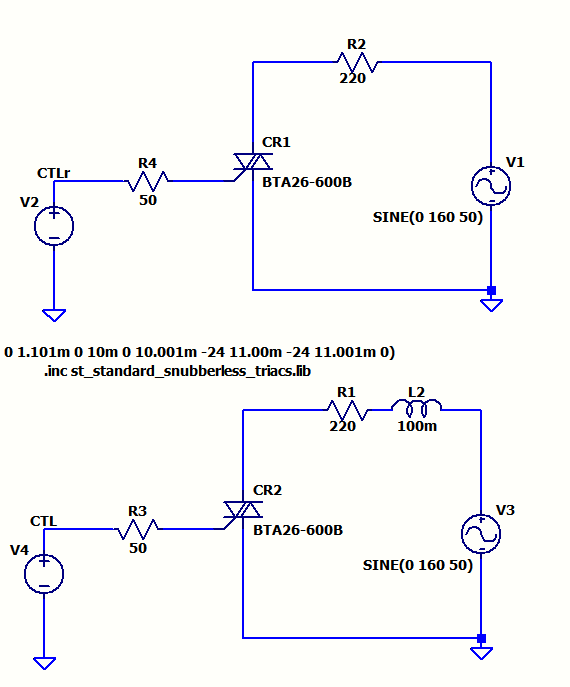 How to safely switch a big inductive load with a Triac using a capacitor snubber? Hopefully someone will have provide an adequate answer. Not the answer you're looking for? Browse other questions tagged triac or ask your own question. Pulse skip modulation vs Phase cutting for AC inductive loads?